Unique vitamin and minor and trace element complex for establishing and replacing substances important to marine invertebrates, including corals, clams, and their allies; these substances are particularly important to biological reactions. Does not contain minor or trace elements notexpressly known to be utilized by marine organismsor take place in chemical interactions. Vitamins are present in ratios found in the tissues of filter-feeding marine invertebrates. Minor and trace elements are present in natural seawater ratios. Shake well before using. Add 5 ml (1 capful) per 25 US-gallons of water in the aquarium system weekly for the first four weeks of use; then, gradually increase the dosage to 10 ml per 25 US-gallons per week if desired. When used in this fashion, 250 ml treats up to 1,250 US-gallons (4,732 L). Shake well before using. Begin by adding 5 ml (approximately 40 drops or 1 capful) of Kōralle-VM per 25 US-gallons of water weekly for the first four weeks of use; this corresponds to adding approximately 4 drops per 20 US-gallons each day. Then, gradually increase the weekly dosage to 10 ml per 25 US-gallons over the following four weeks and maintain this dosage. [Note: if using Kōralle-VM in conjunction with Brightwell Aquatics Rēplenish and/or Vītamarin-M, decrease dosages of those products by 50%.] Starting at a low dosage will not cause any harm to the livestock, and will enable you to notice subtle changes in the appearance of the system that indicate the effectiveness and need for the product. Daily dosing maintains more stable concentrations (and a more natural environment) than dosing weekly, in which the concentration of elements spikes just after dosing and then gradually decreases throughout the course of the week. Vitamins and trace elements are important to biological reactions taking place inside all living organisms, however they are present and required in very low concentrations. Zinc (min) 0.0305 mg/oz. ; Iron (min) 0.00315 mg/oz. ; Manganese (min) 0.00172 mg/oz. ; Vitamin-A Propionate (min): 9.8 IU/oz. ; Thiamine (B1) (min): 7.5 mg/oz. ; Riboflavin (B2) (min): 7.5 mg/oz. ; Niacin (B3) (min): 132.5 mg/oz. ; Pantothenic Acid (B5) (min): 19.5 mg/oz. ; Pyridoxine (B6) (min): 7.5 mg/oz. ; Biotin (B7) (min): 0.4 mcg/oz. ; Folic Acid (B9) (min): 1.0 mcg/oz. ; Cyanocobalamin (B12) (min): 1.9 mcg/oz. ; Ascorbic Acid (C) (min): 180 mg/oz. ; Cholecalciferol (D) (min): 780 IU/oz. ; Tocopherol (E) (min): 22.8 IU/oz. ; Menadione (K) (min): 0.008 mcg/oz. 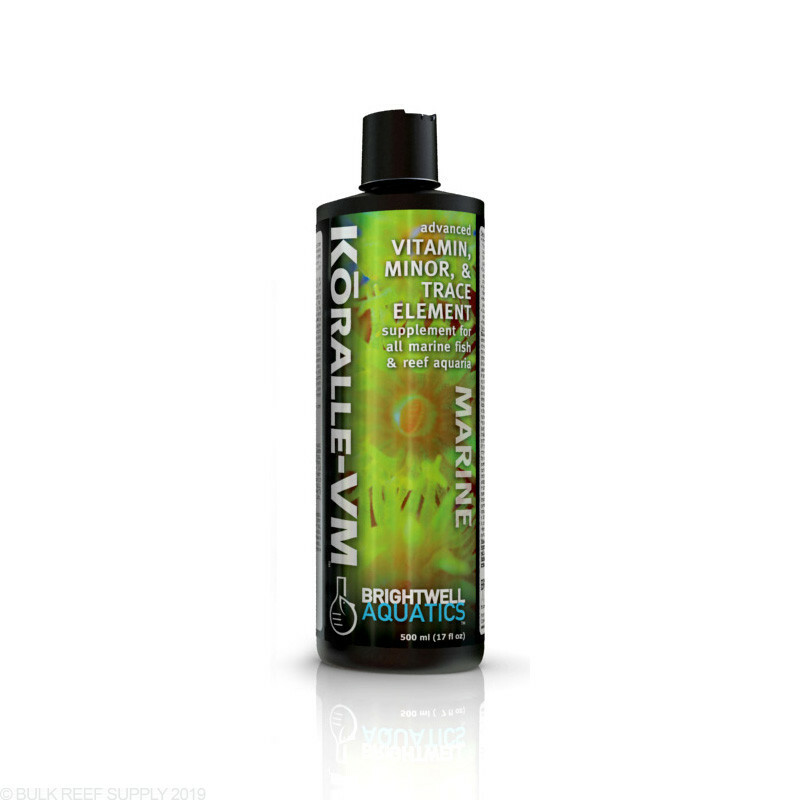 Kōralle-VM provides a host of minor and trace elements found by oceanographers to exhibit non-conservative behavior in seawater (meaning that they are depleted by biological and chemical reactions taking place within the photic zone) and that are safe for human handling. Elements are present in natural seawater ratios (i.e. the ratios in which they are present in seawater). Since they are not depleted by biological nor chemical interactions, no minor or trace elements that are not expressly needed by aquatic organisms are present in this product; this includes unnecessary elements such as lithium, rubidium, and molybdenum. Additionally, a full-complement of vitamins are present in the same ratios found in the tissues of filter-feeding marine invertebrates, organisms that extract plankton from the surrounding water and gain their nutritional benefit, and which are in turn consumed by many reef inhabitants. 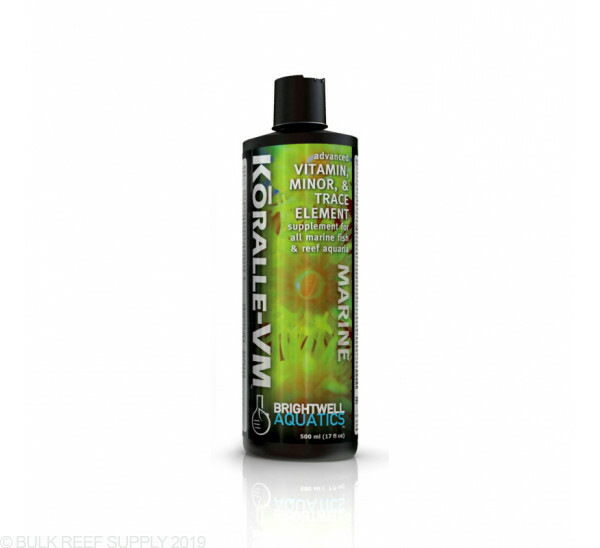 This logical blend of vitamins and minerals is of benefit to all marine aquarium inhabitants. Kōralle-VM does not require refrigeration, however storage in a cool, shaded area will prolong the activity of the vitamins. Refrigeration will maximize the shelf-life of the product. Great value and little fluff. Follow the directions or dose 1/2 to begin with and watch the colors get deeper in your acros. If you add to much, algae will tell you.